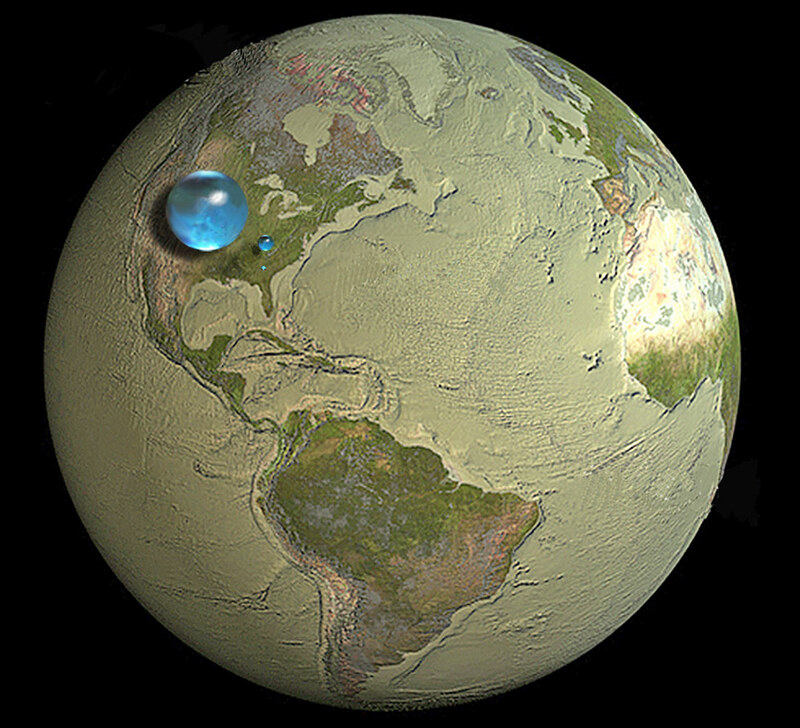 This image show blue spheres representing relative amounts of Earth’s water in comparison to the size of the Earth. Are you surprised that these water spheres look so small? They are only small in relation to the size of the Earth. These images attempt to show three dimensions so each sphere represents “volume”. They show that in comparison to the volume of the globe, the amount of water on the planet is very small. Oceans account for only a “thin film” of water on the surface. The largest sphere represents all of Earth’s water. Its diameter is about 860 miles (the distance from Salt Lake City, Utah to Topeka, Kansas) and has a volume of about 332,500,000 cubic miles (mi3) (1,386,000,000 cubic kilometers (km3)). This sphere includes all of the water in the oceans, ice caps, lakes, rivers, groundwater, atmospheric water and even the water in you, your dog and your tomato plant. How much of the total water is freshwater, which people and many other life forms need to survive? The blue sphere over Kentucky represents the world’s liquid freshwater (groundwater, lakes, swamp water and rivers). The volume comes to about 2,551,100 mi3 (10,633,450 km3), of which 99 percent is groundwater, much of which is not accessible to humans. The diameter of this sphere is about 169.5 miles (272.8 kilometers). Do you notice the “tiny” bubble over Atlanta, Georgia? That one represents freshwater in all the lakes and rivers on the planet. Most of the water people and life on earth needs every day comes from these surface-water sources. The volume of this sphere is about 22,339 mi3 (93,113 km3). The diameter of this sphere is about 34.9 miles (56.2 kilometers). Yes, Lake Michigan looks way bigger than this sphere, but you have to try to imagine a bubble almost 35 miles high—whereas the average depth of Lake Michigan is less than 300 feet (91 meters). The data used on this page comes from Igor Shiklomanov’s estimate of global water distribution shown in a table below. Data source: Igor Shiklomanov’s chapter “World freshwater resources” in Peter H. Gleick (editor), 1993, Water in Crisis: A Guide to the World’s Freshwater Resources (Oxford University Press, New York).